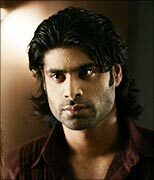 Last Friday, Sikander Kher made his acting debut in the Hindi film industry, and got good reviews for his Woodstock Villa. Sikander has always been warm and affectionate. He was a hyper-energetic kid. Whenever Anupam was at home, he would give him scenes and ask him to enact them after saying 'light, camera, action.' Sikander would love such games. As a teenager, Sikander would pick up accents quickly. He would play pranks by calling people up, and speaking to them in different accents like Italian, Arabic, Australian and British. Even I would get confused when he did it to me. He was weak in academics. In the sense, he would score good marks [if he liked the subject]. If he didn't like the subject, he would not even make an attempt to study it. As a mother, it was very frustrating to make him study sometimes. His general knowledge was very good. His knowledge of world entertainment was good too -- whether it was films, music or television. He was a very curious child. He wanted to know everything and often surfed the Internet for information. Children today are very techno savvy. After he finished school, he assisted Yash Chopra [Images] on Dil Toh Pagal Hai. We are family friends with the Chopras. When I was shooting for Devdas, Sikander was in Std 12. Sanjay Leela Bhansali [Images] would come to my house to discuss the project. One day, Sikander asked whether he could assist him. Then, he was on. Sikander wanted to act as a child. He had attended Anupam's workshop with Abhishek Bachchan [Images], Hrithik Roshan [Images] and Uday Chopra [Images]. When he grew up, he joined the National School of Drama for six months. Sikander could not join NSD's complete course because you have to be a graduate for that. At that time, Anupam was directing Om Jai Jagdish, that's why Sikander could not assist him. Plus, when you assist your own father, you tend to get special treatment. Sikander did not have a big banner launch, as he did not want us to approach any director for him. He tried himself, and he got an offer from Sanjay Gupta. He like the story and took it up. If there was huge money riding on him, it would have been difficult. Plus, he hates people calling him a star son. He doesn't mind anyone calling him an actor's son but with the star son tag, the connotation changes. We are not producers to give our son a big launch. If we were, we would have certainly launched our son. When Anupam was going through financial problems -- when he did not have enough money for his directorial debut, Om Jai Jagdish, and when his school was destroyed by floods -- Sikander knew it. But we, as parents, never let him feel the pinch. 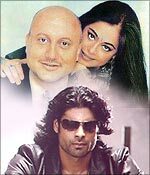 When I left my first husband, Gautam Berry [in 1985], and married Anupam, Sikander did not have a problem adjusting with Anupam. He was used to Anupam, as Anupam was a good friend. They became friends and loved each other a lot. We are very liberal at home. We never spoke against Gautam or try to create hatred in Sikander's heart for his father. Now that his film has released, we are getting quite a few messages, appreciating Sikander's work.